As a new mom, it’s easy to be sensitive to the all-too common inquisitions. Are you breastfeeding? Tried for about 3 weeks and gave up because it was torture. How’s she sleeping? Like a boss since 12 weeks; probably because of the formula. Is that organic? Some of it is. Some of it's Cheetos. Are you trying for baby #2 yet? No. Maybe one day. Maybe not. Did she get the flu shot? Yes. Then she got the flu anyway. Did you make her baby food? No. Is she picky? She wasn’t. Then she learned the word “No”. Truthfully, I feel pretty good about my parenting decisions, so I’m not offended easily. I’ll tell anyone who asks all the ways I became a better mother when I gave up breastfeeding. I’ll tell you that yeah, sometimes I give Charlotte cookies when she has a meltdown so I can finish my dinner in peace. That happens. More often than it should. None of these questions really bother me, but the one that stings may surprise you: Where’s Charlotte?! Now, Where’s Charlotte may seem strange. Allow me to elaborate. I’m talking about people asking Where’s Charlotte in the middle of the day. When I’m at the post office. Or Home Goods. Or Harris Teeter. When I’m on my lunch break. Yeah. I’m on my lunch break because I work. So where’s Charlotte? Well, she’s at preschool, where she spends 40 hours per week. A place that she loves and where she smiles and giggles and jumps for joy upon arrival. She loves the toys, and the teachers, and her friends, and the crafts, and the playground. It’s important to make a clear distinction here. And that is that I want to work. That may be hard for some to understand, but I need to work for my mental health. I need to work to feel fulfilled. I need to work to feel accomplished. To have adult conversations. To feel respected for my opinions. And truth be told, I’m a better mom for it. I look forward to seeing Charlotte every night after work. I look forward to reading her report card (Charlotte was Happy/Busy/Chatty today! We sang songs! We painted Valentines!). I savor and appreciate the time we have together each day and on the weekend. And you know what? I look forward to work too. To the moms that stay home, whether by choice or necessity, you’re amazing. Truly. I admire you and respect you. I think that must be the actual hardest job in the world, and anyone who acts like you get to drink with Hoda and Kathy Lee every morning in your pajamas eating bonbons is taking crazy pills. To the moms that work, whether by choice or necessity, you’re amazing. It’s not easy juggling parenting with work. At the end of the day, we’re all just doing what’s best for our families. And moms, if you haven’t figured this out yet, doing what's best for you is the best thing you can do for your family. You heard it here first. As much as I like to cook, I’m someone who greatly enjoys going out to eat. For the longest time, I found myself wasting so much food because I would buy enough groceries to cook five nights a week. But sometimes after a long day at work you just don’t want to eat that healthy grilled chicken or face the dreaded kitchen clean up. In an effort to stop wasting food (and money! ), I now only buy groceries to cook Sunday-Wednesday. By Thursday I’m usually burnt out on the weekly routine and ready for a relaxing dinner out. Now, let’s be honest. I’m using the term relaxing loosely. Now that I have a full-on toddler who loves using her voice and chucking food at my face, going out to eat can be trying. But alas, I persevere because, well, I like when other people cook for me. And I like when other people do the dishes too. I also want Charlotte to be a good restaurant child because I don’t anticipate a time in my life when I won’t eat a third of my meals out. Order ASAP: Like as soon as you sit down, order AT LEAST an appetizer, if not entrees. Time is of the essence. 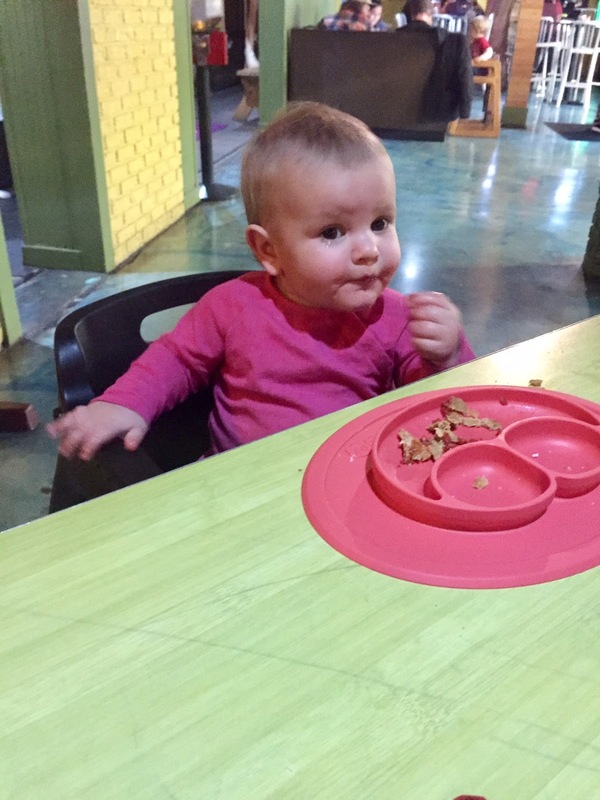 As long as Charlotte’s eating, she’s a happy camper. Keep emergency snacks on hand: I once gave Charlotte an entire can of puffs to keep her busy when she had to crash my ladies night out. These days, we favor veggie straws, gold fish, and fruit pouches. Don’t overfeed them too early: This is where the appetizers and emergency snacks get tricky. You don’t want Baby to be too full when entrees arrive. If they’ve lost interest in food, you don’t get to eat. Try and keep bites of pre-dinner snacks small and draw them out as long as possible. 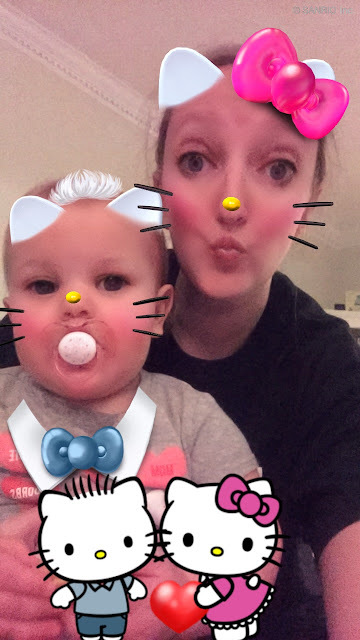 Download snapchat: I had to have a millennial give me a snapchat tutorial, but now that I understand it (yeah, it’s kind of hard for an app), I love it. More importantly, Charlotte loves it. If things start to go south, let that baby see herself as a puppy and that’ll buy you at least 3 minutes while you’re waiting for your food. 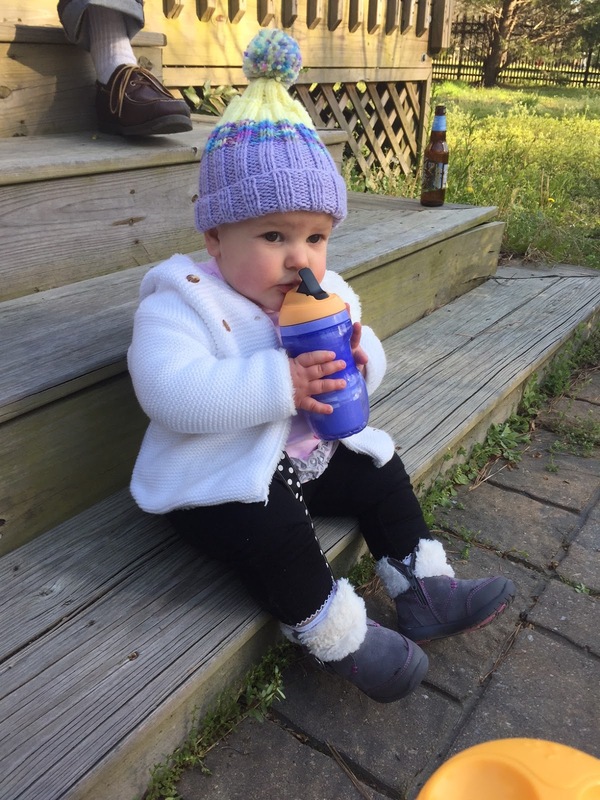 Bring the proper accessories: Sippy Cup. Bib. Baby plate (and fork, if your baby is into that). Plastic Bag. I love this silicone baby plate my sister got Charlotte for Christmas. Fair warning: If it's not on a totally flat, clean surface, it's easy for her to pry off and throw on the floor. As long as it's filled with food, we're usually ok. These pop-up straw sippy cups are another fave. Charlotte loves drinking from the straw, and one less styrofoam cup to waste at the restaurant. Don't forget a bag to take the plate home in! It comes with a zipper bag, which of course I threw away because I didn't think it had a purpose. Walk around: If all else fails, get up. 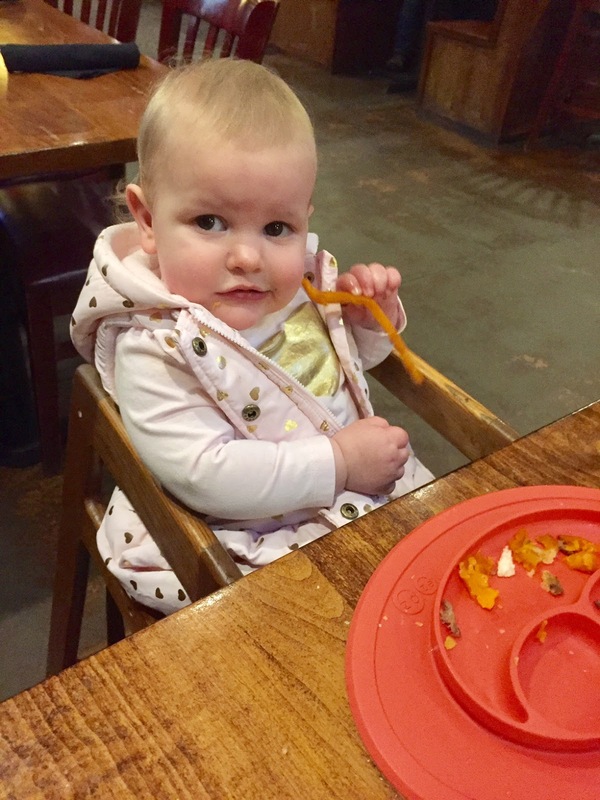 If Charlotte gets fussy while we’re waiting for food, one of us will just walk around with her for a little while. If possible, find a neon sign to stare at. Carefully consider the time: Shy of Ruth Chris, I will take Charlotte pretty much anywhere if we go at 5:00. That’s prime kid-time in restaurants. Charlotte loves cheeseburgers. Who knew? Lastly, I have to end with some sound advice for new moms: GET OUT NOW! Seriously. To dinner. To Target. To HomeGoods. Whatever you fancy. Embrace this time when your infant can stay parked in snuggly carseat and snooze for a few hours. I don’t care if it’s 4:00 or 8:00. If you feed, burp, and change your baby and know that they’ll sleep soundly for 2 hours after that, then embrace that time you have! And don’t be afraid of germs. No one will touch a sleeping baby in a car seat. I promise.